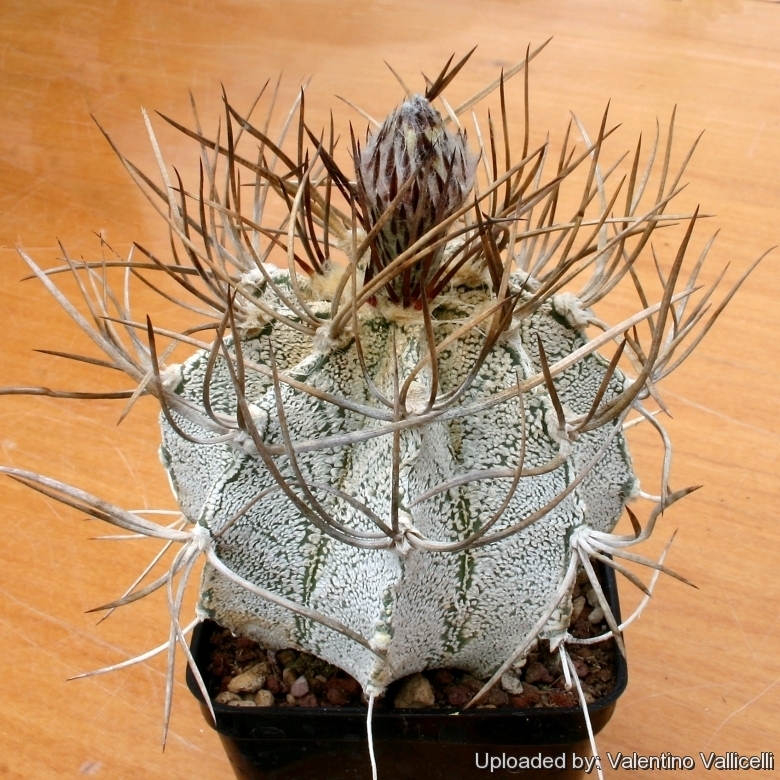 It is a variety with striking rigid thorns and very more closely whiter flocking, it is indubitably one of the more beautiful of the astrophytums. Habitat: Desert of Chihuahua at an altitude of about 600 m among the impenetrable “Mesquite” woodland (spiny bushes) along with Lophophora williamsii, Ariocarpus fissuratus and Echinocactus horizonthalonius. 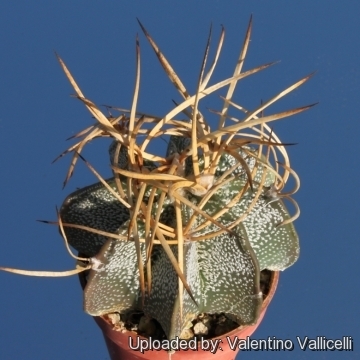 It grows in gravely soil among limestone rocks in a very dry area (±180 mm rain/year mainly from May to September). The temperature is very variable either seasonally and daily. Freezing temperatures in the winter are quite frequent. The insulation and luminosity are also very strong. The seed dispersion in habitat is pursued by ants. Description: A. capricorne v. niveum is bigger than var. senilis and var. aureum, and its dimension are similar to the standard species. Stem: Robust, at first globular then cylindrical up to 50 cm tall, diameter up to 20 cm (this size correspond in habitat to a 50 years old plant). 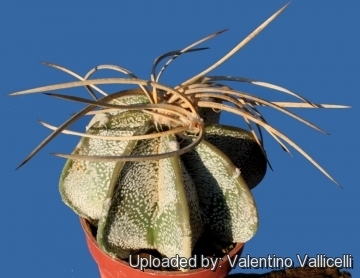 The epidermis is densely covered with white flecks that give the plant a furry look. The hairy scales are pure white also in the new growth, while in the type species the new flecks are initially brownish and turn into white only lately. 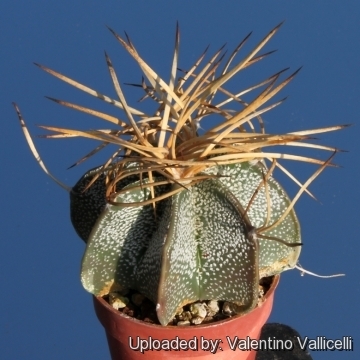 Spines: 6-8 per areole, striking strong of variable size (max. 7-9 cm long) flat, bent upward and not very wavy. Brownish-blackish that turn grey-chalky as they age. 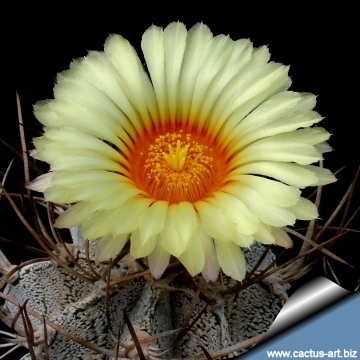 Nice yellow and white spined forms are also common in cultivation. Flower: Medium sized, 7 cm (max. 9 cm) yellow with a red or orange throat. Fruit: Fruit and seeds are identical to the standard species. 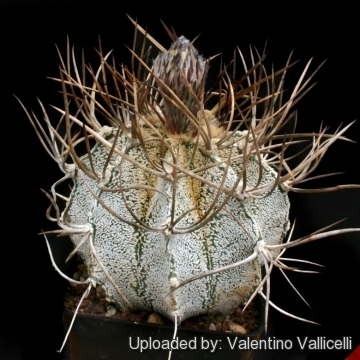 Notes: This variety has been discovered only on 1930 by Viereck on the North the town of Cuatro Cinegas, Kaiser made the first desription in 1933 with the name Echinocactus capricornis v. niveus, the same year Okomura renamed it with its actual name.